Showing search results for Friends With Benefits Quotes, Quotations & Sayings 2019. Friends with benefits = good enough to hang with, good enough to lay with, never good enough to be with. Can we go back to the days where it was just you & me? We were so happy back then. Carefree, no drama, just a boy & a girl who were simply crazy for each other. I miss those days. All we have now are the memories of what we used to be, & the thoughts of what could have been. Don't be the friend with benefits be the girlfriend or wife with commitments. Flirtationship; meaning is more than friendship less than relationship. We act like a couple, but I don't get why aren't we together yet. Sometimes saying that you dated somebody is just a polite way of saying we banged a couple of times. We all have that one friend with the hot sister everyone wants to get with. Friends are of two types; those who have friendship truly and faithfully and others who make friends just for benefits. Friends with benefits are utilized by their partner to achieve something and very soon it is forgotten. “Many friends will walk in and out of our life but only true friends will leave footprints in your heart “said Eleanor Roosevelt. 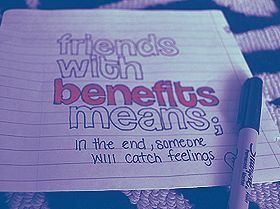 As long as friends with benefits do not cause any harm to either of the two involved, it does not matter. But when only one of the friends feel deceived, it leaves a permanent scar in the minds, eventually making them fall apart. Those who benefit from friends also think they are wise making use of the opportunity but this is only short lived. In the words of Ann Landers, “friends with benefits? More than friends? Don’t sample the goodies unless you are willing to risk addiction and withdrawal.